How Fast Can You Go on a Kick Scooter? What is the Weight Limit on a Razor Scooter? Kick Scooter vs. Bike which is better? How to maintain my scooter? Are scooters only for kids? Which deck height should I choose? Should I get a scooter with a hand brake? Who says fun ends as you grow old? So many adults are opting for kick scooters to get to work or simply have fun in the park and streets. Now there are countless varieties of these all over the market and choosing the most suitable one for you can be a tad bit confusing. Before we delve into the details of the best adult kick scooter and what you should know before getting one, let us tell you what exactly what they are. Finding the right product for you can be difficult, let alone choosing a product for someone else. However, we have pulled together to create this review, in order to make the whole process easier for you. This is the only Razor Scooter in this list and it is the best Razor for grownups out there. It is a strong one with aluminum t-tube and deck. These materials are air-craft grade which ensures durability. It has patented rear brake for controlling speed. Razor scooters are known for their light weight and this one is no different weighing only 9.4 pounds. Despite its own little weight, it still has the ability to withstand a lot of rider weight, 220 pounds to be exact. This is the same as many of the high end scooters listed here which goes to show that it is good enough. Like every other model, it folds easily with its patented folding system. There is only rear brake which is enough to speed down or stop the scooter. The wheels are quite large so rollover any kind of surface seamlessly. If you have big sized feet, you might not be able to put up both your feet on the deck especially when wearing boots. This Razor A5 scooter is one of the most affordable brands on the market right now. This is obviously is very cheap so you can replace them easily from time to time. However, with its quality frame and sturdy big wheels you most likely will not have to. Why We Liked It – It comes in three different colors: blue, pink and red. This allows a bit of choice for riders who want something colorful for their commutes or recreational rides in the park or streets. For an adult, there are not many choices in terms of colors so this is a plus. Fuzion Cityglide B200 Adult Kick Scooter has two brakes i.e. the traditional rear brake plus a hand brake on the handle bar. This makes controlling the scooter very easy even when it is in high speed. The entire scooter is made from lightweight aluminum. In fact, it is one of the lightest weighted scooters on this list. Other than the weight, its wheels make it a must have too. It contains two oversized wheels with a 200 mm diameter. The PU adds to the overall light weight effect without compromising on quality. Even though it is not heavy, do not get the impression that you cannot ride it on rough surfaces. Be it a ground or uneven pavement, you will have a good journey with this incredible scooter for adults. 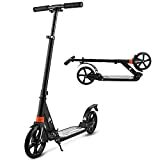 This Fuzion Cityglide B200 Adult Kick Scooter is one of the cheapest options on this list so anyone can easily afford it. It is, without doubt, good value for money because you get quality build frame with sturdy wheels. The handlebar goes as tall as 36 inches so it is suited for adults that are above 6 feet. If you have ever used Cityglide scooter before, you would know that their products are all about convenience. Fuzion has the signature Cityglide easy folding mechanism which allows you to fold it quickly and carry wherever you like. And carrying the Fuzion Cityglide B200 Adult Kick Scooter is of course not a problem because of its feather-like feel. Why We Liked It – The fuzion cityglide adult kick scooter has a blue and black combination that is perfect for summer days when you ride the scooter on the streets and feel the breeze on your face. The big wheels are all blue inside and look very cool. The fuzion cityglide adult kick scooter’s style and color make it good for both teenagers and grownups. Based in Germany, Hudora ensures that their riders get the best out of their scooters and enjoy every bit of it and that is exactly what this model does. The Hudora Big Wheel 320 is made from high density aluminum alloy which as you by now would know makes for a durable yet lightweight material to be used in a any top model. A standout feature in this one is its high prioritized security. You will have a stable ride that gives good balance and never lets you fall even if you are a beginner. It has GS German safety certification so you can absolutely be sure about safety. If the fear of falling was keeping you from riding one, then by all means give Hudora Big Wheel a try and all your fear will be gone. The handle goes very tall and can be adjusted to 41 inches. This is more than enough for a very tall person who is, say, above 6’7”. The lowest handle height is 32.7 inches so you can say that even teenagers can travel on it. It is ergonomically designed to keep it as comfortable for all riders as possible. It is good value for money considering it is top quality with a guarantee of safety. German products are known worldwide for their cutting edge technology and with so many features this grown up kick scooter lives up to the expectation pretty well. Why We Liked It – It has many unique offerings like a warning bell and a shoulder strap which can be adjusted according to your height. When you spend so much money on a product you naturally want a lot from it and this is exactly the case here. These features come in the price of a normal high end model but provide added security. The EXOOTER M2050 Black Edition is an all-rounder because of its sturdy build, immaculate design and cutting edge technology. First off, it is very strong as it is entirely made from aluminum. The weight capacity is 220 pounds which is good enough for most adult riders. The wheels differ in size as the front wheel is bigger than the rear one. The front one has a diameter of 240 mm while the rear one has 180 mm diameter. This apparently helps make the journey smoother as the front wheel is able to surface smoothly on rough terrains. Therefore, you can use it for rides on uneven pavements and streets without feeling any pain in your hands. The folding process is a breeze due to the spring system and the parking process is quick too thanks to spring shock kickstand. In just a few seconds your kick folding scooter is all folded up and ready to be carried anywhere. And do not worry about getting tired with carrying it because you will not due to its low weight of only 11.5 pounds. The kick folding scooter is all black and will definitely be a favorite for those all those fans of the ‘stealth’ look out there. It is a beautiful product for your everyday commutes to work, class or around the neighborhood, not to mention the entire workout you will be doing by riding it. Why We Liked It – Riding a scooter will surely get you thirsty and you can just hang your water bottle on the Exooter M2050. There is a self-adjustable bottle holder that is very sleek and makes your rides hydrated. You can keep up to 32 ounces of any beverage. Can anything be classier than black and white? This scooter speaks volumes about the owner’s style because it is just that much appealing. Anyone from teenagers to adult can travel on this one and make some eyebrows rise. But do not think this adult scooter is limited to style; it has a lot of other qualities too. The wheel used is robust and strong thanks to the high rebound polyurethane layer. They can bear the roughest of surfaces without even making you feel a thing. Another great thing about this scooter is its kick height which is very low. You do not necessarily have to bend the knee to kick it which makes it super comfortable to guide and you never get tired. Every component is made to be long lasting. Take for example the rear fender which has a hinge. It moves to the hinge instead of bending. Not just the tyres, other parts too are created to withstand frequent use. The deck is not too wide which means if you have feet bigger than the average size you might not be able to keep them both at the same time. Nevertheless, the low kick height more than makes up for this lack because giving it kick is so effortless you never really want to stop it. The adjustable handle bar goes up to 38 inches which is decent enough for even basketball players. The weight limit is pretty decent as well. A person up to 220 pounds can enjoy riding it. Why We Liked It – The color combination is timeless and this is what makes this scooter a must have for anyone who has an eye for style. With a little care, you can preserve its color for as long as you use it as there is no question about quality. Globber is a name associated with quality in the world of scooters. This Globber Adult One is of course no different with its high quality metallic build and powder coat finish. It has rear brake connected with a pull lever on the handle bar so you can easily stop the kick scooter with your hands. The wheels are quite big with a diameter of 188 mm. They have the ability to withstand very tough terrains as they are made from high rebound and high quality polyurethane. Wheels make up the most important component because they take all the beating during your rides. If you are looking for a scooter whose tyres are sturdy enough for any type of surface, then this is the product you are looking for. It is easy to fold and at only 11.8 pounds, super easy to carry around when not in use. The weight limit is 220 pounds only as compared with other products on this list. Nevertheless, it is a sturdy model was created to last long. The mudguard helps protect it from any splashes and additionally can be worked as a brake system when you keep your foot on it. Whether it is raining or you hit a mud patch, you are good to go. It is good for commuting, working out or walking your dog. The quick brake system really helps in the latter most case because with a dog you never know when it might stop all of a sudden. You just hit the brake and it stops in a stable fashion. Why We Liked It – The handle bar on this one is definitely a winner because of its large size and curved shape. The shape gives a more natural grip and makes moving it around much easy. The bar is 19 inches long which is great because even very tall people with big hands can ride it. Xootr is the second name of quality and convenience in the world of scooters. They are known for their light weight and portability. This Xootr adult kick scooter has its deck made from Magnesium (Mg) which makes it the most light weight big wheel adult scooter anywhere out there. It weighs only 9.9 pounds so if your aim is to find the lightest scooter, this is the answer. It is also powder coated and CNC machines so you have a well-rounded product that delivers high quality. The braking system is BMX style with front brakes and rear brake as well. This is necessary considering it is very light weight. No matter how speedily you are kicking it, it will stop in a stable way whenever you hit the brakes. low too which allows more stability and ease of kicking it. The handle is adjustable, even a person as tall as 6’7” can easily travel on the Xootr adult kick scooter. These products are all about making the ride smooth and easy so that the rider falls in love with it and once you scoot around on it, you really do love it. Since it is quality made, there is no question about its durability. If maintained properly and stored safely, you can use the Xootr adult kick scooter for many years even. Just simply fold it and store it somewhere safe when not in use. Why We Liked It – These are hand assembled Old Forge, Pennsylvania and therefore carry the Made in America vibe that ensures quality and durability. It is one of those products that are made keeping in mind the customer and consider their satisfaction as high priority. And therefore every single component lives up to the expectation. The Oxelo Town 9 push scooter offers so many things; it is definitely worth every penny. The first and foremost quality is its wheels that are 8 inches in diameter and provide extra stability. For an adult, this stability is crucial because of varying weights and even riding styles. The low floorboard adds to this stability and makes kicking it a breeze. There is a second brake on the handle bar so you can be absolutely sure about safety. You can easily stop the scooter anytime you want at any speed. There is front suspension and anti-vibration dampeners on the rear wheel which makes it even more useful. Which is great if you are a grown up and want a smooth ride while commuting. This is one of those products that make the best of current technology and bring you ease, comfort and control. The ease does not end with the braking system. You can easily fold the thing within a second thanks to the patented EasyFold technology by Oxelo. This is actually incredible because if you are in a hurry to get to a meeting or class, you do not have to spend time on trying to fold it. There is a trolley mode as well that lets you drag it around rather than lifting it and carrying it, all the more reason to buy this scooter especially if you need to carry it as much as you ride it. There is an anti-theft system to secure the push scooter with a pad lock which is great because it is an expensive thing and needs protection from thieves. Why We Liked It – Despite ease of use and quality build, this product is a killer in terms of style. The overall look is attention grabbing and there are two fantastic colors to choose from: white and titanium. The wheels also add to the look of the product with their shine. If you live in a metropolis and need something that lets you scoot around town smoothly and effortlessly, this micro suspension scooter will do the job. It is able to achieve this smooth performance thanks to the high tensile springs in the front and back of the deck. Moreover, the rear springs is adjustable to your weight. This way no matter how bumpy and uneven the sidewalk or street is, you will be able to kick this thing without any hindrances. Not only is the journey smooth, the handle bar is smooth and easily adjustable too. With just a button you can fold the entire thing into a lightweight easy to carry structure. Even the tallest people will be able to travel on this scooter without the need of bending. If you find the buttons difficult to fold the scooter, you might need to turn them a bit and you would feel their spring get stretched. This is more affordable as compared with other models here. Nevertheless, it is good value for money because you will use it very frequently and fall in love with it once you take it out for the first time. The springs absorb the nastiest of shocks from uneven surfaces and give you a seamlessly smooth ride that is like no other kick scooter in this regard. Why We Liked It – The smooth riding experience is the USP of this product and that is the exactly what we love about it. Let us be honest here, most pavements and streets are not that great and the bumps make riding an adult scooter annoying when it is supposed to be fun. With this, you do not have to worry about that. The Cruz is the original Xootr. Made from 9-ply Baltic Birch, the deck is beautiful. It has anti-slip grip tape already present, so you can be rest assured. For those who like to Skateboard, you will feel right at home with the wooden deck on the Cruz – it also gives a lot more flexibility. This is great for the commuter, as the road and sidewalk cracks and potholes will be less invasive. As the Deck is quite wide, you are able to have your feet placed side-by-side – this is known to be quite rare! Why We Liked It – It folds! Yipee! That’s enough to tell you why we love it. But we won’t stop there… The wooden deck is super flexible, and we like this (as avid skateboard lovers). We feel right at home on the scooter – and you probably will, too! The Micro Flex is yet another scooter designed specifically for those bumpy sidewalks and offers the smoothest ride ever. This is the entire essence of this scooter from handles till the wheels. The deck is made from a composite or fiberglass and marine ply which gives it the ability to absorb strong shocks. The tyres are big enough to be ridden effortlessly over smooth or rough surfaces alike. Just one strong kick and this thing will slide like butter on a hot pan. Quality is another factor that makes this product so much desirable. The bearings used, the materials, the tyres, everything is made from industrial grade and is claimed to be durable. One would think that when the focus is so much on smooth journey, quality of materials would not be that great. On the contrary, it is a complete adult scooter that ticks all the qualities that you could possibly want in a scooter. This is one of the most lightweight products on this list weighing only 10 pounds. For city commuters, this seems to be an important deal because they cannot leave their scooters outside their house or work and usually have to fold them and carry. Of course, like almost every other adult scooter it folds easily too. Wherever you are going, just quickly fold it down and carry in your arms or a bag and just snag it somewhere. That is how easy your life can be with the help of this. Why We Liked It – There are times you need to park your scooter and Micro Flex has a two way kickstand that can be quickly pushed forward or backward. Although not too extraordinary, this is still good for those needing to quickly kick in the stand and go on their way. Here is another master piece from Micro that has air filled tires. Yes, the wheels are 200mm in diameter and made of high quality rubber. This makes it more like bicycle, if you will. The purpose behind this take on a push scooter wheels is to make it extra smooth and light in terms of travel. The tires have to be fully inflated to run and make sure that the pressure is correct (80 PSI). You can see that written on the tires themselves. Since smooth rides are the essential quality for micro scooters, micro Flex Air is no exception. Like the Micro Flex Series Kick Scooter, this Micro Flex Air too has a two way kickstand that is very helpful when you need to quickly park it. Folding and unfolding requires a bit of effort but when you do it the first few times you will quickly master it. It follows a double button folding system. To unfold you release the folding clamp and then press and hold the two buttons that are on the sides of the front wheel. The process itself is much easier than it sounds. It comes all assembled and ready to take out. It is good for most kinds of terrains and the tires are quite sturdy so you do not have to worry about facing a flat tire situation. Whether you are on a sidewalk, a hill or a park, you will love how smooth and light it feels. Why We Liked It – The all silver metallic look of this scooter makes it look classic while the air filled tires give it a modern feel. The overall piece labeled with Micro logo shines brightly in sunlight and is quite noticeable at night too. It ensures that you get a bit of style alongside quality. You know how you thought scooters were restricted to pavement? It is no longer true! The Razor Dirt shows that off-road scooting is awesomely fun, designed for battling through dirt and all. Take your riding to the max with the RDS used by Team Razor riders for their epic tricks. Why go off road? Because it’s fun. Just because you are an adult – doesn’t mean you always have to act like one. Some of us are very young at heart, and this Scooter helps accentuate and celebrate that. Why We Liked It – The RDS is heavy-duty full stop. You can take it through woods, sand and more! Bring out that energy and Go BIG! Like other Exooter products in this list, the M1350 8XL also has a maximum weight capacity of 220 pounds. It is designed for urban commutes that are quick and involve uneven surfaces. There is dual-suspension one at back and one in front to absorb all the shocks from rough city streets. This model is definitely a top performer due to its large bounce PU cast wheels. You get a smooth and fast trip without any hindrance or wear on the tyres that readily take all the beating while you enjoy the wind in your face and hair. The ABEC 9 bearings make the wheel movements swift and add to the whole performance efficiency. Since it can go quite fast it is only suitable for late teenagers an adult and children should not try to play on it. Exooter is a reliable brand for push scooters and you can trust its build to be durable which means no matter how many times you take it out in a day, you will achieve the same performance every time. Yes of course a little care goes a long way so in order to really make it last long you should maintain it well. It is not high-endnd scooter so good for those who have limited budget but still want good scooter to enjoy. Why We Liked It – It has a compact folding system with a carrying strap which is why this should be your choice if you are going to need to carry it a lot. During commutes, especially in cities, carrying your adult scooter is unavoidable so this feature comes in quite handy. The Vokul VK-205 has big wheels too measuring 205 mm in diameter which gives it more stability than those with regular 180 mm wheels. This big size also helps in absorbing shocks from bumps during the rides. The deck has a low to ground style so kicking it is very comfortable. You will not even need to bend your knee to do that resulting in a trip that can last for hours without tiring you even a bit. The wheels are made from strong rebound PU which allows them to be so shock absorbent. Like many other strong and lightweight designs from other brands, Vokul VK-205 also uses aluminum made deck to achieve strength without being heavy. The rear wheel is covered with fender made from 65 Mn Steel which makes it very strong. It also comes with a manual so if you are someone who has little or no knowledge about them, you will find it extremely helpful. Many an adult shy away from them simply because they have never ridden one before and miss out on so much fun. It can be used to commute to work during rush hours or to see your friends. It presents you as a smart person who is striving for a healthy lifestyle and reducing his or her carbon footprint. Why We Liked It – There are a lot of small details in this product that make it standout from its competitors. For instance, the steering tube in front contains over 60 marbles and a lubricant as well for smooth functioning. It also features the patented 3 second fold mechanism which no doubt is pretty useful. With it’s striking appearance, simplistic riding, and useful kickstand, the Oanon is a great choice to be considered. The Oanon is comfortable, and safe as well as being totally transportable – as you can fold it up at any point! The grips are made from the softest sponge for added comfort. Made from strong Aluminium Alloy, and weighing only 4kg, this sturdy but transportable scooter is a fantastic choice for the daily commuter. The length is 86cm/ 33.9 inch, with a Deck Size of 53 x 11cm/ 20.9 x 4.3 inch (L x W x H). Oanon Scooters Folding Kick is suitable for those 12 years and over. Why We Liked It – There are many qualities to the Oanon, such as the soft sponge grips and ability to fold. This is ideal if you use the scooter to travel to the Bus or Train Station and would like to fold it up and take with you once you arrive. The price is a great selling point, for a product so practical and sturdy – it is not one to be missed! The AGDA is very quick, while also being super quiet. The AGDA is motorised with a rechargeable 36V 8AH Seal battery system. You get a drum brake, kickstand, and 8-inch pneumatic tires for a truly comfortable ride. The battery charges in 4-5 hours. The AGDA 350w has high-torque and will reach speeds of up to 11.18 mph, and will travel a distance as much as 24.85 Miles on a full charge. Why We Liked It – The Battery Powered AGDA is perfect for adults who want to go on longer journeys, and simply enjoy the world around them – observing from a smooth running electric scooter (see our full buying guide by clicking here). It’s great for commuting, and you can save money on fuel or ticket fares quite easily! The GBTiger is sturdy and will support up to 220lbs in Weight, due to the fact it has been carefully designed and created with dense and firm aluminum alloy for the frame, with more than enough foot space for an adult. The design of the deck is low to the ground, for more steadiness as well as the height of the handlebar being incredibly useful and adjustable – there are no limitations on ride height! The rear brake enables you to come to a quick, but smooth stop. You will feel very safe on this scooter. To add even more to the safety and comfort of this awesome kick, there is Shock-Absorbing System on both the front and the back. The 200mm rubber wheels are accompanied with a Dual-Suspension System… if we hadn’t convinced you enough already. Vibration is reduced to the max in the GBTiger, ready to glide your way through the suburbs of even the busiest and bumpy, unforgiving city. You won’t even notice on the GBTiger! Why We Liked It – The GBTiger is ideal for those 12 years and up, whose journeys and rides tend to be in areas that can be tricky. Why? Because of the suspension and shock-absorbing features of this comfortable scooter. This makes a fantastic choice, for anyone who loves comfort and practicality. The brilliantly priced Urban Riders Commuter Prelim is made effortlessly usable with the folding system that has been added into the design – with the commuter being the main influence, and inspired by the needs of said commuter. Once one has finished with the leg of the journey that required the scooter, you can simply fold it up for carrying onto subways, and any other alternative method of transportation. You can store the commuter Prelim very easily with the kickstand included into the practical design. The handlebars are comprised of high grade aluminium, while adding to the practicality by being adjustable. Why We Liked It – A perfect choice for commuters, the adjustable and foldable Commuter Prelim Scooter has been designed with the Commuter in mind – this much is clear. Everything about the useful Prelim shouts easy and practical. The Urban Riders Scooters are very well priced, and are great for Adults dipping their toe into Scooters. First of, the price of this Ancheer is unbelievable. At this price, it’s a bargain for what you get! The Ancheer big wheel scooter has a folding-system like no other. In fact it’s so good it has been patented! The Ancheer also has a 4-level adjustable handlebar, to add more value to this budget scooter. The large wheels help to reduce bumps and ridges, as you go along the roads. The frame is lightweight at only 8lbs, but consists of aliminum alloy for durability. There is no need to worry about quality concerns due to the low price, because if you are unhappy with the build – you are guaranteed a 100% refund. Why We Liked It – An incredibly low priced scooter, that is light and practical. If you are unsure about scooters, but curious – this is the one to try out! The value of this product is truly outstanding. You’ve got functionality, some comfort and a 100% money back refund guarantee. The Go-Ped Know-Ped is made from quality materials that are aircraft grade so there is no doubt about its durability. No matter how frequently you use it, you will not be disappointed by its performance. This one is proven because it was created back in 1997 and has since only seen improvement. If you owned or even just know about the Sport scooter by Go-Ped, you will find these remarkably similar. The only difference is just the basic mechanics as Sport was gas powered. It is lightweight and foldable making it very easy to carry around. Despite the light weight, it is capable of standing 400 pounds which is much more than an average person’s weight. The wheels are big which makes the kick scooter good for almost any kind of terrain. People use these products for all kinds of purposes and if you come across varying kinds of surfaces, this product can be your savior. Whether you want one for commuting to work or class, or are looking to shed some pounds, the Know Ped can serve all these purposes for adults. It is good for all heights so even you are exceptionally tall you might not have to hunch. Nevertheless, the handles are very easy to maneuver and they also have brakes so even more control for you during your rides. Made in America, this scooter is definitely going to keep working for years to come. Why We Liked It – It is super easy to carry around and can be carried to your work or class. Since it folds, you can just snug it in to space under your desk or seat. You do not have to worry about parking it somewhere as it can easily stay with you wherever you go. If you love bikes you are going to love Schwinn Adult Shuffle. Why? Its front wheel is 26 inches which makes this model more like a bike except that you kick it instead of pedaling. This is perfect for an adult who has never ridden a scooter before and want to give it a try. Whether you want to join your kids, or work out a bit, this should do the job for you. The alloy front and rear brake with linear pull allows you to stop it in a controlled fashion. The alloy rims are very light weight too. With a big sized wheel such as this one, you would expect that it would be difficult to control it but it is not. With front brakes you can easily stop without losing balance. Of course, this is heavier than other scooters on the list as it weighs 27 pounds. The stand over height is 21 inches and the total length is approximately 70 inches. It is quite big indeed and therefore suitable only for grownups. The structure itself is made from steel so there is no doubt about it strength. It is painted white which gives it an even more classic look. If you want a scooter for purely recreational purposes, this should make a good choice. Commuting with it may not be so easy because you cannot carry it so you are bound to find a parking spot for it. Nevertheless, the trip will be nice and controllable not to mention attention grabbing. Why We Liked It – The classic Penny farthing look of this scooter is a mix of curiosity and frivolousness. It shows that even if you are an adult, you are pretty young at heart and open to exciting things. It is definitely going to earn some fans when you take it to your park or kick it down the street. Here we have the Mongoose Expo Scooter for Adults, new for 2018! The Mongoose Expo is fairly new to the market, and is fast becoming a popular choice. This is due to the larger road tires and the fact it is perfectly designed for both commuting, and sporting uses. The 20lb scooter is great for getting to work, but is non-foldable. This means it may be difficult maneuvering around if you also need to catch a train or bus. It has pneumatic front and rear tires that make up the 12inch wheels, which are suitable for most terrains (pavement, brick, woodland etc.). Why We Liked It: The Mongoose Expo is great for those that commute short distances (with no need to use public transport), and especially for those that commute over various terrains, as the 12inch wheels can most likely handle it! So you’ve made it to the end of the products… Or have you? Not quite! We are about to throw a Spanner in the works with our Alternative Choice! A new section we’ve been working on, with an aim to provide you with a choice you were not expecting. This week, we’ve got the Razor California Longboard Scooter! Now, we know it looks different. Epically different. That is why we love it. It mixes the best of both a Longboard and the added stability and ride ability of a scooter. For those who want to longboard, but want to perform scooter tricks – this is the option you didn’t even know you needed! You can thank us later! Why We Liked It – This made hybrid has got us all taking at HQ! It is so “out-there” and we love that. The integrated kick tail enables you to perform some epic tricks that just wouldn’t be possible on a standard kick. We know you want this longboard-scooter – because we want it, too. Each product on our top 10 list has been carefully selected from hundreds of available products. To reach the MyProScooter top 10, the product must be good quality, loved by existing owners, and highly rated. We have selected products for different budgets, without compromising on quality – we believe there is something for everybody on this list. Each product has been researched, to ensure it is worthy of making our list, so that we can help you find the perfect product for you! When looking to buy a new product, you need the information fast and it needs to be informative. Our review is formulated to achieve this, so let us know what you thought of it by leaving a review at the bottom. A kick scooter also known with just the name scooter is a vehicle that is powered by you. It has two wheels, a deck for placing your feet and a handle bar. You push it with your foot from off the ground and give it a kick, hence the name. They are made from different materials like aluminum, steel, ply or titanium. From kids to grownups, anyone can own and use one to go around as it gets you to your destination faster than on foot. There are 3 wheels scooter for grownups too that can be categorized as kick scooters. These are quite simple and consist of a small number of parts. Each of course has its own importance for the scooter to be functional and safe. The board where you keep your foot is called the deck of the scooter. All the parts are connected with it. This is made from metals like aluminum or titanium and sometimes even maple ply. The deck of course has to be strong because it takes the weight of the rider. You will usually find the maximum weight limit mentioned with the item. The size varies which determines if you will be able to place both feet vertically on it. Generally, for grownups, a wider deck is more stable as it provides more room for feet placement. You can say that wheels are the most important part because these are the ones that are in touch with the ground all the time and essentially bear all the work. There are two rollers attached at the either ends of the deck. They are made from rubber but the technology used and the quality varies. The size varies as well especially in adult scooter in order to provide more sturdiness. Most of them are 180 mm in diameter but some are quite bigger than that. You will also see scooters that have different sized front and back wheel. Bigger wheels ensure that they absorb all the shocks from bumps and go smooth on such surfaces. The handle bar is where you keep your hands while you push along on the scooter to work from home. This is a brilliant design and helps you maneuver it, whilst keeping in contact with the road. On some models there is a hand brake which is very useful when weaving in and out of traffic so you can stop quickly if a hazard appears. These are adjustable so you can adjust it according to your height. Most adult scooter will have enough height of handlebar (as much as 40 inches) so even a person taller than 6 feet can easily ride. You can speed down or stop it with the help of brake. Usually there are rear fender brakes which provide the braking system. However, some makes even have a hand brake at front on the handle bar. If you want added control and are very cautious about safety then find the one with dual brakes. Many people, especially those who want to use it for commuting, consider speed as an important factor for choosing the right item. Those who consider them to be toys assume that these do not go very fast. Truth is they can go quite fast depending on the quality and the wheels and even the rider himself. There is no definite answer but consider as an example the Micro Kick Black which can go up to 12 miles per hour. This is pretty good for something being pushed by the rider himself. The speed largely depends on the wheels if they are smooth, rigid and high quality you can go much faster. This is the beauty of the experience because they can help reduce your commute time by more than 50%. They are good for recreational purposes too because you get a good work out and the whole experience lightens your mood and makes you happy. Many an adult like to ride with their kids and have a good time. As you know Razor produces scooters for both children and grownups. While the weight limit varies from one model to another, for example a Razor scooter for an adult has a weight limit of 220 pounds. These themselves are usually very lightweight themselves but are capable of bearing adult weight easily. Since adults are going to ride these, the weight limit is ample for people with above average weight. Most scooters easily bear 200 pounds and those with more sturdy build can even withstand up to 400 pounds which is more than enough. This is very important because exhausting the weight limit can damage or at least affect the performance of your scooter so make sure you find out the correct limit. The electric scooters are usually legal to be ridden on the streets or pavements. They can be ridden on the bike lane. However, this is not universal and laws vary by places. To know exactly if you can legally ride an electric scooter on your city’s streets, check out the laws regarding vehicles on the road. They are mostly legal too which makes them a great choice for using it to commute notably in cities with very much traffic congestion. There are separate bike lanes which can be utilized and people even ride them on the sidewalks. Again, it does not hurt to be sure beforehand so find out about your city in particular. You will be required by law to ensure that you ride it safely without hurting yourself or others. In most cases, if an officer stops you it would be because you are not wearing a helmet. Safety is absolutely necessary so always make sure you wear one whenever you take your scooter out for a ride. Scooters are super popular now and there are multitudes of brands to choose from. Some popular brands are Razor, Micro, Go-Ped, Xootr, and 5STARR. These brands are known for their high quality products made using latest technology. Some riders have a personal preference towards one brand for varying reasons like styles, availability, durability or pricing. This is more of a personal choice but you can find various colors and designs from the creators of these products as well. Many products come in two or three color variations. However, you do not have a lot of choice unlike in scooters for kids. Even though they were created for an adult to travel on, they are designed with colors and style to make it more attractive and fun after all riding a scooter is to have a little fun too. Most models can be very expensive depending on the brand you are choosing. Several high-end brands can easily go upwards of $200. Nonetheless, there are more affordable options as well in the market that have good enough quality. Razor and Micro are cheaper as compared with other expensive brands like Know-Ped. You can easily find a scooter under $100 online. Of course like other vehicles we buy, a bigger price tag means that the components are high quality and will likely last quite long. Almost all of them are foldable which makes them so much easy to carry around and store in confined spaces. In fact, manufacturers keep on trying to improve these systems and use technology that allows the structure to be folded in about a second or two. This is yet another great quality that people appreciate and serves as the reason why they use them so frequently. Since they are lightweight you can carry them anywhere without any difficulty or tiring yourself. A very important consideration during the buying process of an adult scooter should be the replacement parts. The availability, quality and price of parts should be determined before buying especially if you are buying an expensive model. No matter how carefully you use it or how strong the thing is, there is always a chance of a part coming lose or stop working at all. In such a case, if you cannot find a replacement the scooter will be rendered useless. You might want to replace the tyres, the bearings or the deck after sometime to give it a new look. Wheels are relatively easier to find and you can find varying sized disks online. The parts should also be available from the brand the scooter is from. So do a quick search about the parts and see their availability before making the final call. Accessories help make your scooter more fun and useful. You can find many accessories online like handgrips, bottle holders or foot peg. The handgrips are usually the part that get wore out quite quickly and need replacement. You can find colorful, absorbent and strong handgrips online. The foot peg can be attached to the front or rear wheel and can be used for placing your foot. The bottle holder of course holds your water bottles while you travel on the scooter. There is no doubt that these brilliant items are getting very popular in cities around the world. Not only are they fun to travel on but allow you to reach to places quickly without getting stuck in traffic or standing in subway and also gets you some exercise as well. And the added bonus is that you can say that you are going green with a self propelled scooter and opting environment friendly commuting ways. Anyhow, many individuals end up comparing the scooter with the bike as to which is better. The most appropriate measure for finding which is better is to evaluate your own needs and the distance you need to cover. But first let us look at what differentiates the two and what pros do they have on one another. Both of these essentially use the human power to move but there are some significant differences. You are standing on a scooter whereas as on a bike you can sit. The former only needs a push off the ground to move whereas the latter needs peddling from both feet. Bikes can go faster than a kick scooter but they are not as convenient as the other. You can easily fold a kick scooter and carry it somewhere because it is so lightweight. Many find it as a good alternative to a bicycle. Some bikes are foldable too but not as portable. For more information on trick scooters, check out MyProScooter’s full range here. Now that you know the pros about each, you should know which is better for your needs. If your ride is, say more than 6 miles, a bike would be a better option. On the other hand, for rides under this threshold a scooter is much more viable and convenient option. These can go pretty fast and get you anywhere in half the amount of time. Plus they are a lot of fun to ride and look very cool thanks to the scads of designs available online and in the market. The best way to ensure that your scooter lasts long and its parts stay functioning is to make sure that you maintain it well. Much like everything else in your possession, a little care will go a long way and your money’s full value will be received. For your rides to be smooth and speedy like the first day you kicked it on the street, you need to clean it often. When on the street, park or sidewalks it will definitely accumulate a lot of dirt and debris from the ground. Every part will get extremely dirty at one point so use a cotton cloth for cleaning it through. Start with the deck and clean it from top, bottom as well as the edges. You can damp it a bit too to get things even cleaner. Do not forget the tyres because they are the main contact point with the ground. Similarly also clean the handle bar with the same cloth. The handgrip can be replaced after it has worn down from all the sweat. It is generally a good thing to ensure that the bearings are clean and lubricated. You can also replace them if you feel that they have been used fully. You can find many helpful videos online about lubricating or replacing the bearings. Doing all of this, you will ensure that the parts stay functioning and you get the most comfortable experience. Now, everything has a limited life and even the most expensive might need replacement of parts after some time. This is normal but with maintenance you can ensure that you get the maximum outcome from them. Generally, you should avoid taking it out in rain because water can damage it. A little rain might not affect so much but a lot of it will definitely affect it. Most of these are powder coated to prevent rusting but still other parts like bearings, buttons or brakes could weaken after sometime due to constant contact with water. Also, inspect your scooter from time to time whether its brake is working and all the parts are fixed the way they should be. Doing so, you can save yourself from any injury and of course save your scooter too. No, a very big no. They may have been created for kids or teenagers but now they are being created specifically for grownups. It is just another vehicle like your car or bike. They are all designed keeping your body and weight in mind so they are sturdy and big enough to withstand your weight and reach your hands. More and more adults are opting for these all around the world. Why? I could give you many reasons but the most common one is traffic congestion. People from big cities like New York City or Tokyo are fed up of being stuck in their cars for hours every day. The public transportation is not that fast too in many of such cities. In such a case, these provide a healthy and quick alternative. People are using them to get to work, meetings, school and of course for recreational purposes. Another great benefit is that you get some exercise as well. You are using your foot to push it and constantly moving your legs as well as torso. It is just enough to burn some extra calories you acquired during the day but not much tiring. You can also see it as a way to reduce carbon emission. Almost every big city is facing the harrowing effects of pollution and global warming. Scooters, as you know, are completely human powered so there is zero negative impact on environment. Imagine how much carbon dioxide can be reduced if we stop taking our cars for small errands throughout the week. This is a great way to get involved in the green movement and help make your own city livable for your children. Lastly, it is incredible fun. Have you never wished of doing everything you did as a kid once again? Well here is your chance. With these you can really feel the adrenaline you once felt as a teenager. There is absolutely no shame in kicking a scooter down the street with your 6 feet height. In fact, everyone will find it very cool. You can go travel with your kids in the park and bond with them while keeping yourself healthy too. There are just so many benefits of these things that everyone should give it a try. So in a nutshell, not all of these designs are just for kids. Safety is a priority for manufacturers and they ensure that the product they send out meets all the safety requirements. For this purpose, many of them test these products rigorously to see how durable and strong they are. This is the reason why most models, especially those high end ones, are capable of going on any kind of surface no matter how rough or bumpy it is. Some are even certified for safety and you can usually find this information online as well as in the package. This ensures even more that the product is safe. It is a good idea to read the reviews before getting into a purchase and see if any of the previous users had any difficulties or faced any safety hazards. No matter how safe the product is advertised as or if it is certified, it is necessary that you take the safety precautions yourself as well. This means that you have to wear a helmet every time you travel. You can also wear knee pads if you want even more safety. Helmet is absolutely necessary because even a minor fall can prove dangerous. Many times people do not realize and they get concussions. Riding is supposed to be fun but nothing is more important than your health and safety. If you are a parent and your kids ride one too then it becomes all the more necessary. They will look up to you and follow you and for them too safety is important. You can find many affordable and stylish helmets to wear while riding online. First of all, understand what deck height really means. It is the distance between the ground and the board. This affects your riding in two ways: a. you are able to avoid any bumps or lumps, and move over curbs smoothly and avoid hitting the surface with the bottom of the board, b. you have to bend your knee a bit. If the height is too low you have the chance of bottoming the deck with any bumps or rocks causing scratches to it. If the height is too low then you have to bend the knee of the leg on the board to let your other leg reach the ground to kick the scooter. A middle road is the best way to go and you can find that out through the ground clearance. Anything between 60 to 70 mm is good enough for a balanced experience that saves you from bumps and does not really necessitate bending. Those types that are a bit tall are compensated with big wheels that go very fast and hence require less kick to begin with. So you should also check out the size of the wheel to ensure how fast the scooter will go and how often will it need kicking. Manufacturers are working on improving these products and are designing scooters that address these little problems. This is the exact reason why now is the best time for an adult to get a scooter for riding around town because they have gotten so much better over time. The quality has improved significantly and the rides seem effortless now. The height was created keeping in mind the different kind of terrains in the urban areas. The sidewalks are usually not smooth and have cracks. Same is the case with streets and some people even like to travel in hilly areas. If you are getting even a moderate quality scooter, it will be capable of withstanding some of the toughest terrains out there without any difficulty. This depends entirely on you and your safety needs and also at times the scooter itself. Usually they come fitted with the brake at the rear wheel but some have a dual system where you have one on the handle bar called the hand brake. The basic advantage of this brake is that you have more control over the ride and it is easier to press the hand brake for some people. It provides added safety because you have two ways to stop or slow it down. If you are concerned about the safety of your travel then by all means get the one that has both the brakes. This way you can assure yourself that your trip is in your full control and that nothing will go wrong. If you have one without a hand brake and want to add one, you can do so. You will need some parts for achieving this and some help from the internet or an expert. The parts you will need include a lever, brake cable, brake pads, cable binder bolt, and barrel adjuster. You can easily find these parts in any hardware store. You can try doing it yourself or take to a specialized shop for getting an expert to do it. There are videos online that you can watch and take guidance from. This is a difficult question to answer, because the safety of a Scooter is down to the acts of the rider. You need to ensure you are fully aware of the implications of certain movements, and terrain adjustments as you scoot along. Keep an eye out for other road users/pedestrians, wear the appropriate gear (helmets, protection pads etc), and stay savvy on the paths. Don’t stray to an unknown road, with blind corners etc. Simply, keep your wits about you! Your shoes play an important role in staying safe, too! Make sure your shoes are flexible and comfortable. Ensure you are kept warm, if it is cold out. Make sure your helmet is unmarked, and fully functioning – it has to fit perfectly, as well. You also need to make sure your Scooter is correct in size. The handlebars need to be adjusted to suit your height, the brakes need to be functioning correctly, and the deck needs to be large enough for your feet to sit comfortably. In order to find the right one, you should go for something that is lightweight yet quality made so as to last long. This is important for those who are going to use it for commuting mainly because you will use it rigorously and often roughly because of uneven sidewalks of cities. You also need convenience like foldability and portability which to be honest is there in most of the products. Of course your budget should be a consideration as well because the price range is quite wide. For more information on complete scooters for performing stunts on, click here. The wise thing to do is to read all scooter reviews and then make the decision comparing the product with your requirements too. If you have an eye for style and want something to go with your personality, you will find multitudes of options to choose from like stylized decks or accessorized handlebars. Ditched my expensive car for one of these. So good for commuting and so much smaller and lighter than a bike. Easier to dodge pot holes in NY too!! Thanks Jason, I got the Cityglide kick scooter and it is RAD. Saving so much money on commuting!